After having late lunch in Raub, we headed to Kuala Lipis, the third and last town on our itinerary. This was also where we stayed our night. It took us about 30 minutes to travel from Raub to Kuala Lipis. It was already evening when we reached Kuala Lipis. The first impression I had about Kuala Lipis was the town is spread out and hilly. Since there were no proper signage, we spent about another good 30 minutes looking for Bukit Residen Rest House – where I already booked for the night before we came. We tried to call but nobody picked up the call. Only after I went to the police station and enquired about the place that we managed to locate the 74-year old bungalow on top of a hill. The bungalow is located just a short distance from the police station. I chose this as our accommodation because of the rest house’s long and rich history. 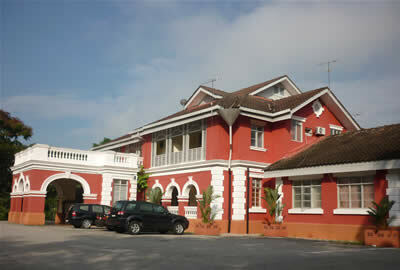 It used to be the official residence of the first British Resident Hugh Clifford in Kuala Lipis. We booked a RM90 room with attached bathroom but the staff made a mistake and we had to stay in a RM70 room instead. That showed how efficient they run the accommodation. My wife was not very impressed with the cleanliness of the place. No doubt it is a nice bungalow-turned-hostel. But the way it is being run does not do justice to it. It could have been better because buildings of this nature can easily be turned into luxury boutique hotels in the hands of an experienced hotel manager. I agreed as I kept sneezing when I was in the room. The reason? I have a sensitive nose and I will sneeze continuously if a place is dusty. We also agree that if we happen to be in Kuala Lipis again, we will try other hotels. We wanted to have dinner at the highly popular (and expensive too!) Low Kuan Restaurant. But it was closed. Not sure if it’s good or bad. After our dinner at another restaurant next to KFC (there is not many dining options in Kuala Lipis though), we took a stroll around the town. 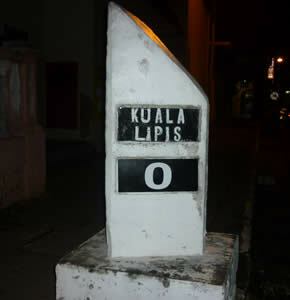 In Kuala Lipis Old Town, there is only one major road, aptly called Jalan Besar. We toured around the “0” milestone which is located just in front of the post office. Then we walked around Medan Tangga – a walkway connecting Jalan Besar and the Jelai River. 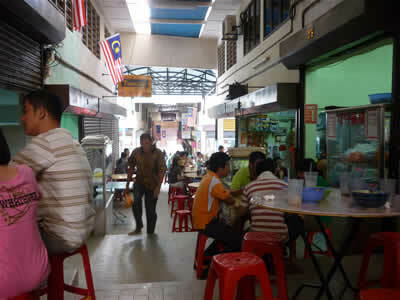 It is a place for diners to hang around for cheap local street food. Day and night, this is a place for the famous char kuey teow. In the morning, it houses the popular Pulut Rendang and Hakka Mee. Note: This is the 5th article of A Family Road Trip to Pahang: Bentong, Raub, and Kuala Lipis series.